Backpack purses are worn over the shoulders like a backpack, yet feature the stylings of a purse. Typically less bulky than a backpack, many stylish options are available to choose from when shopping for this versatile accessory. Sometimes referred to as mini-backpacks, backpack purses are available in a wide range of styles and colors. 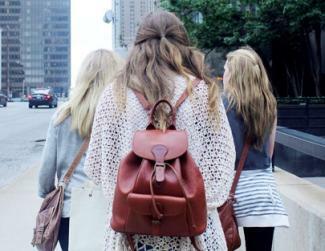 Bianca Rossi of eBags.com explains, "Handbag backpacks are great for every type of persona. The versatility of the backpack, combined with the chic styling of a handbag makes the backpack handbag a truly functional fashion accessory." Whether you like fabric or leather or prefer a slick or quilted look, there are plenty of great options available. Target is a great place to shop for budget-friendly backpack purses. If you're looking for a simple, inexpensive backpack purse, Merona's Backpack Handbag (pictured) may be a good fit. Retailing at around $30, this bag is available in both black or black and cream stripes. Made from polyurethane, it features a zip closure and small handle top. The straps are adjustable. A reviewer states that this bag goes with everything and describes it as "the perfect size." Mossimo Supply Co. offers a backpack handbag that is also a good option if you're looking for something inexpensive. Retailing for around $30, this bag provides a good amount of storage and has adjustable straps. Reviewers say this bag is durable and a good size. If you are looking for an impressive selection of affordable and stylish handbags, eBags is a great choice. The Isabella Backpack (pictured) from Cezar Mizrahi is a favorite of Rossi's. "I like this bag because it's made of leather, which makes it a little bit more polished and chic enough to carry from day to night," she says. Reviewers also say that this bag is roomy and stylish, and mention that the design makes it comfortable to carry. Available in black, brown or charcoal, this bag features a simple design, silver hardware, and is made of leather. Expect to pay around $100 for this bag. Rossi also suggests the baggallini Urban Backpack. "I like this backpack from baggallini because it's made of fabric that is lightweight, so it can be worn while traveling or when you need to be hands free," she says. This bag can be adjusted to wear as either a backpack or as a sling bag. Available for around $45, it's available in either black/sand or cheetah. Dooney & Bourke is known for designer status and outstanding quality handbags. The Nylon Flap Backpack from Dooney & Bourke features a small top handle along with the shoulder straps, allowing you to use it either as a traditional purse or as a backpack purse. The nylon and leather combination make for a durable bag that has a simple style. It has brown leather straps and a recognizable Dooney & Bourke logo on the front. The bag is available in a variety of color combinations and retails for $139. Reviewers say this bag is spacious and cute, with many praising its functionality. Dooney & Bourke's Pebble Grain Backpack is another stylish designer option. This is a larger bag, functioning as a backpack, but with the stylishness of a purse. Available in black and retailing for $348, the prominent Dooney & Bourke silver plate on the front of the bag add to its attractiveness. A reviewer on the Dooney & Bourke website says this is a great bag, capable of holding a lot of items without becoming uncomfortable. Vera Bradley bags are distinctive and durable. 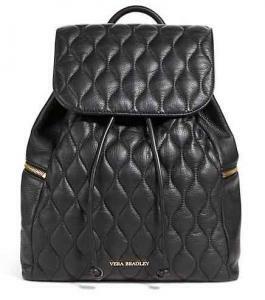 The Quilted Amy Backpack (pictured) is a leather backpack purse available in black, magenta, taupe and burnt orange. Reviewers praise the bag's quality and roominess. It's important to note that this purse is larger than most and the solid leather look is a bit of a departure from the signature Vera Bradley fabric look, but this particular bag is quite stylish. Available for $258, Vera Bradley fans will appreciate the colorful interior and the multiple pockets. A non-quilted - yet incredibly stylish - option from Vera Bradley is the Drawstring Backpack. Made from faux leather, this bag is available in a variety of colors. Available for $108, reviewers on the Vera Bradley website say the color choices are good and the multiple pockets are useful. Nordrstrom is a great place to find luxurious designer handbags, including backpack purses. A true signature piece, the Falabella Shaggy Deer Mini Backpack (pictured) from Stela McCartney is made of vegan-friendly faux-suede and features gold toned chain-link shoulder straps. A Nordstrom reviewer says this bag is lightweight and likes the bag because it is "something different." Available in both beige and black, this mini backpack retails for $1,295. The Marni Zip Pocket Backpack is another luxurious option. Available in coal, this lambskin leather bag features both interior and exterior pockets and a small top handle. A reviewer of this bag praises its simplicity. Buy for $1,310. The basic style of a backpack or sling purse is to have a narrower top with a drawstring opening or flap, widening to a larger base. The actual dimensions, strap widths, and features vary depending on the manufacturer or designer. These casual handbags are made for quick, easy access and convenient carrying, freeing the wearer's hands for other tasks. Some sling purses are made to be worn over just one shoulder, while others can be worn over both shoulders. Many include a top handle for traditional carrying if desired. Look for a backpack purse that not only suits your style, but also provides all the function you're looking for. Materials vary widely for backpack purses. The most common designs use canvas, leather, or denim, but other materials such as nylon, suede, and satin are available. Backpack purses have a variety of different features that allow them to adapt to different personalities and situations. "Buyers should look for secure zippers and a hidden pocket on the back side of the backpack to securely store keys, phone, etc.," advises Melissa Haynes of eBags.com. "Buyers should also look for the size to fit proportionately to their body size. I think it's also convenient to find a backpack handbag with a small top handle - this makes it easy to pick up quickly when it's sitting on the ground or table." Strap design. Some sling purses have very narrow straps that may be uncomfortable if the bag is heavy, while others offer a zippered option where two small straps zip together to become one thicker strap. Padding, adjustability, and durability are other strap features to note. Pocket arrangement. Many bags offer both interior and exterior pockets. All exterior pockets should be secured with buttons, clips, buckles, or zippers for security. A small interior pocket for ID cards, cash, or miscellaneous small items is a nice feature, and divided compartments help keep the purse organized. Specialty compartments. Different bags may offer specialized compartments or hooks along the side, handle, or interior to accommodate cell phones, iPods, keys, or other equipment. This is a handy way to keep these items safe and easy to find. Durability and maintenance. A stronger bag will last longer, and one that is either machine washable or can be easily wiped will stay looking its best longer than less durable models. Because of their convenience and ability to hold more than most standard purses, backpack handbags are great for shopping, sightseeing, travel, and day trips, particularly if extra items such as a small guidebook or a camera are required. Very stylish bags are also great for active dates or even semi-formal events. On the other hand, just as every purse does not work for every situation, backpack purses are not appropriate for very formal events such as weddings, nor are they suitable for professional use. Because they are worn out of sight, they may not be the best choice for crowded situations where pickpockets are a possibility. They are not typically large enough to serve as diaper bags or to carry multiple school books. Backpack purses are a stylish alternative to bulky, awkward backpacks or too-small handheld bags. With a virtually unlimited range of styles and colors coupled with multiple useful amenities, these convenient bags are great for many situations.